Brewing your own beer is one of the best ways to control the exact flavor of a batch, the alcohol percentage, and quite a bit more. 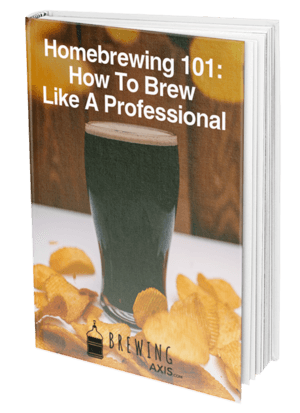 Of course, if you don't have any experience with brewing beer, then the first thing you're going to need to do is to acquire the right equipment for the task, and this can be a bit of a challenge. When it comes to getting the right brewing supplies, you'll want to be sure that you focus on the larger parts of your setup first and foremost. 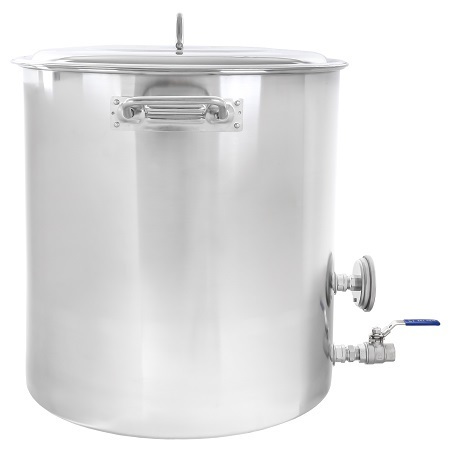 For example, some of the most critical pieces of equipment you'll need to brew beer include a fermenter and a range of pots for various applications. One of the most crucial pots you'll need for home brewing is a brew kettle, which will need to feature an adequate seal as well as a range of other features. Before we get to our complete review of this 15-gallon kettle from CONCORD, we're going to take a look at some of these features so that you can be sure to find the best pot around. The first thing you should consider when buying a new brew kettle is the price point, as that will determine whether or not a product fits into your budget. Keep in mind that you’re best off setting a concrete budget before you begin shopping, as that will help prevent you from overspending. While the typical rule is that products with a higher price point are often built to higher standards, you may be surprised to learn that this isn't always the case with brew kettles. Some products with a higher price point just aren't worth the money and you can sometimes find cheaper pots that work better. Of course, the next thing you have to consider when you’re looking for the right brew kettle is the volume that it can hold. 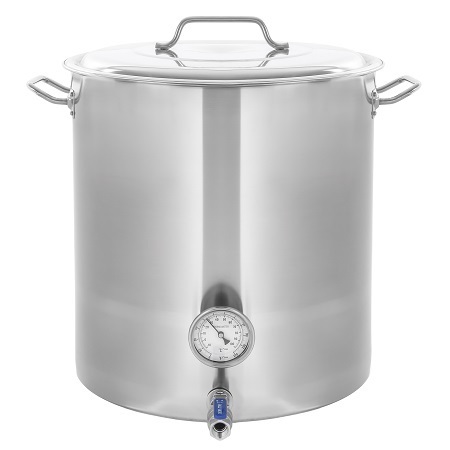 If you’re looking to brew larger batches of beer, you’re going to need a brew kettle that can hold the wort that you want to boil, and we’d recommend a five-gallon pot as the bare minimum. If you’re only brewing for personal consumption, then a kettle around 10 to 15 gallons should be ideal, though if you want to be able to brew for friends and extended family, larger is better. Of course, the size of your kettle will determine the price point because of the amount of raw materials used and the work that went into it, with larger models being pricier. 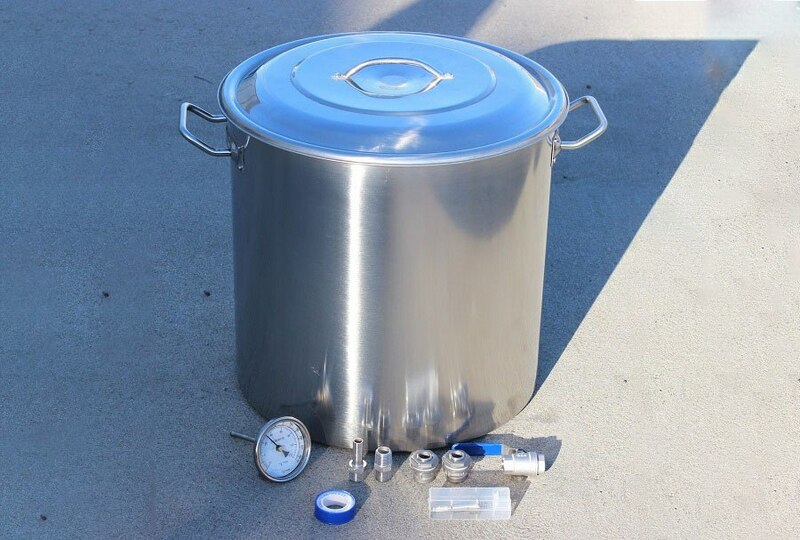 This model is made by CONCORD, who is a well-known manufacturer in the world of homebrewing, and their products typically feature high-quality construction. Thankfully, that trend continues with this model, as it features excellent accessories, impressive build quality, and more. If you need a quality brewing kettle that features a large capacity, the CONCORD 15-gallon stainless steel kettle is one of the better models out there. For example, the stainless steel construction helps make this kettle far more resilient than alternatives that are made out of aluminum. Beyond the material used, this kettle also features excellent construction, with a design that's free of welds so that it will be far easier to take apart and clean thoroughly. Taking this pot apart is as simple as putting it together, as it comes unassembled, but all you need is a wrench to put it back together. 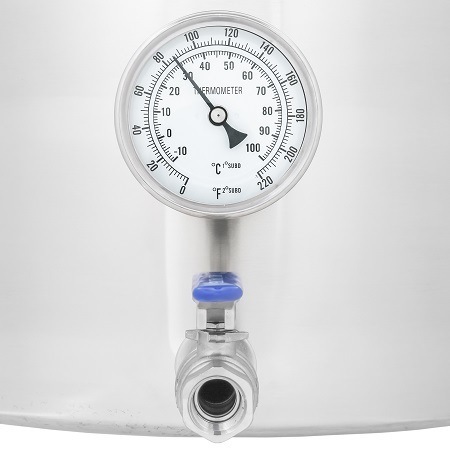 The 15-gallon capacity means that this kettle is suitable for larger batches of beer, ensuring that you won’t have to worry about boil overs or boiling your wort several times. The integral thermometer on this brew kettle is relatively accurate, and if you have a problem with your readings, there is a calibration screw on the back of it. While this pot is versatile, we'd recommend it for extract brewing primarily because of the relatively thin bottom. The seal on this kettle is adequate, but we'd recommend using your own Teflon tape. Keep in mind that this model is also a little more expensive than some of the competition because of its quality construction. We also decided to go through customer reviews and testimonials so that we could get a better idea of buyers’ experiences with this product. Starting off with the positives, this kettle was praised for being much more durable than most of the other options in the same price range thanks to its commercial stainless steel construction. Many customers also mentioned how easy it is to assemble, disassemble, and clean out this brew pot. Of course, this model is not without its downsides, and some buyers mentioned that it isn’t ideal for grain brewing because of the relatively thin bottom. However, keep in mind that reports of scorching were relatively rare, even when this model was used for grain, though repeated grain brews may end up affecting this pot’s integrity. You’ll find that this is one of the more expensive pots of this size, and this is due to the high build quality as well as the helpful accessories that come included with it. If you like the look of this stainless steel pot, you may find the 130 dollar price point to your liking. This model may not be the best choice for buyers who are looking for a budget brew pot, but if you need something big and sturdy, this kettle should be worth every cent. As you can see, this is one of the best brew kettles on the market, as it combines reliability with a set of helpful accessories. If this review helped you out, feel free to leave us a comment down below and let us know what you think.